WHAT IF YOU COULD STOP ONE? Need a BODYGUARD fix? Then this new bulletproof illustrated novel is the shot in the arm you’ve been looking for! 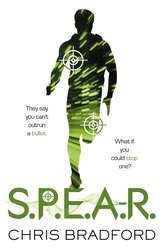 Caught up in a deadly terrorist attack, Troy discovers he is bulletproof and is soon recruited by a mysterious organisation known only as S.P.E.A.R. WHEN THE BODYGUARD IS THE TARGET?